This black and white box with ribbon and clear window is a great gift for anyone as well as any holiday, birthday, etc. 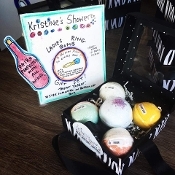 It comes with one bathbomb that has a ring inside as well as 4 separate moisturizing bathbombs in Girly Girl, Sunny Days, Get Fresh and Peaceout scents. Please pick your size below.